Half time discussion was muted as it always is in such situations, not that we’ve been in such a position very often in the past. No one was willing to articulate the idea that we had Tipp for the taking. All we had to do was keep hurling like we were and we would be Munster champions. Even looking back on it now a few days after the event, the memory of the spasms of fear that coursed through my body as the brain tried to adjust to this incredible new reality make me shiver again. Credit therefore to the Munster Council for their charmingly daft half time show, which saw a group of musicians and dancers prance around on a stage in the middle of the ground. Never mind that the players could not be really playing their instruments as the music was clearly being blasted out over the PA system. Ignore the blatant sexism in a scantily clad woman lepping around in the rain, then the ‘man’ with her hauling off ‘his’ clothes to reveal her true femininity beneath, clearly meant to appeal to the male majority in the crowd. It was different to the usual squish box show, and it put a smile on many careworn faces. For we had many cares as the second half rumbled into view. Waterford emerged about a minute before Tipperary for the second half, a noteworthy change to the other McCarthy regime when Waterford would seem determined to stay in the dressing room until the next Ice Age – a tactic that always cracked me up, before anyone thinks I’m taking a go at Ger Mac. The impression was also given of tea cups making rather forceful contact with the walls of the Tipperary dressing room. And Nicky’s mood can’t have been improved in the early moments of the second half as Waterford fired over two quickfire points to take the lead. There was some hasty inspection of trousers on the City end terrace to ensure that they were brown. Tipp weren’t beaten yet, or at least they didn’t think they were. While their much-vaunted back line was creaking alarmingly, giving Ken McGrath so much space that he was in danger of becoming agoraphobic, any group of forwards from Tipperary is bound to have gifted hurlers who can pick you apart before you know it. And so it proved when the Tipp attackers combined brilliantly to put Benny Dunne in the clear on the edge of the small square. Waterford defenders charged across to try and cut out the danger, but it was all in vain as the Tipp new boy deftly flicked the ball past Stephen Brenner. Okay, this wasn’t the end of the world. Not that this was the popular viewpoint on the Déise terrace, where the end of the world would have been a blessed release. But the team had other ideas. Faced with such adversity, they reacted like a demented model railway enthusiast’s track layout. Point, point, point, point, point. Some were swashbuckling Ken McGrath specials, others more prosaic efforts, such as when Paul Flynn knocked over a free when he might have gone for a goal – you let me down that time, Paul. Either way, Waterford had reacted in the best possible manner to Tipperary putting it up to them. At this point, I was moved to speak the unspeakable. Turning to my brother, I made the hardly earth-shattering observation that “if we keep our nerve, we’ve got it won”. He cringed at the presumptuousness of such a comment, but we could all see that it was true. Waterford had the wind, they were winning plenty of ball and every one of the forwards was chipping in. 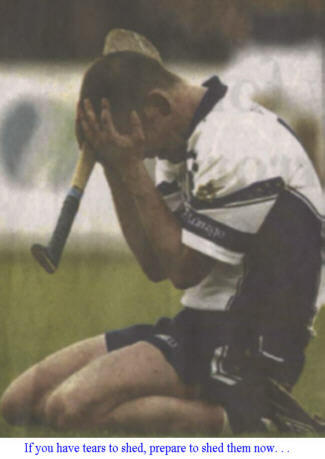 As Tony Considine pointed out in his Irish Examiner column the next day, Paul Flynn was the weakest of the Waterford forwards, and it wasn’t as if he wasn’t pulling his weight – don’t even THINK of saying it! It was clear that Waterford were winning the battle of the sideline. Tipperary was burning and Nero English was fiddling away. My dad was sitting in the Covered Stand, and he noticed (for he is a Corkman, and probably wasn’t watching the pitch much) that while Justin McCarthy was strolling around with a look of utmost serenity, Nicky had the appearance of a man with a firecracker up his arse trying to extinguish the fuse with his hands. Waterford seemed to be on top in every area. Seamus Prendergast played centre-forward against the wind, at full-forward when we had the wind. John Mullane was roasting Donnacha Fahey, so Waterford got the ball to him at every opportunity. Any loose ball breaking around the half-forward line was being cleaned up by Eoin Kelly. 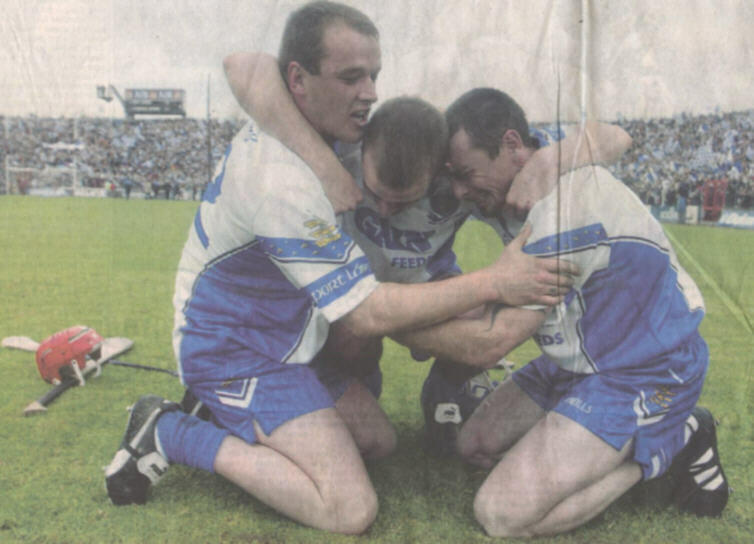 Ken McGrath was breaking Tipp hearts wherever he went. And Fergal Hartley led a concerted effort to monopolise the ball. It was looking good. So good that some of even felt confident enough to say that it was looking good out loud. But Tipperary, as well as having all the artillery that tradition can provide, are also a brilliant team. Any time they got the ball they threatened, and they made good on that threat in a mirror-image replay of their second goal. John Carroll bulldozed through the Waterford defence, displaying bravery and no little skill. He fed Eoin Kelly who in turn found Benny Dunne in space, this time on the opposite side of the goal. But the result was the same. Rather than driving the ball home, a quick twist of the hurley and it was in. No need to try and split the ball when you’re that close in. Tipp were in front again. Despair flooded through us all. One voice on the terrace raised the concern, a little unreasonably, that Stephen Brenner should have advanced from his line to snuff out the danger. We needed to get back on terms ASAP, and that’s exactly what the players did. A free from Flynn and another mazy dribble come Kelly put us back on level terms. Tipp took the lead again, Eoin McGrath pegged them back. We were still well on top, but how were we supposed to win if Tipperary kept on poaching goals at a rate faster than we could accumulate points to insulate ourselves against them? Then came the turning point. Yes, the game had more twists and turns than an inebriated snake wrapped around a tree. And to choose a goal may seem a little obvious. But it was the build-up to the goal that made this the decisive moment. Tipperary were attacking, looking like they could add another goal whenever they liked. They had gotten close to the goal when the ball squirted into the middle of a mass of players. Amidst this forest of swinging timber, Tom Feeney reached down with his hand to clutch the sliothar to his bosom. It was crazy. It was foolhardy. It was so wonderfully brave that songs should be written about how Tom Feeney saved the day. And had his hand been broken in the process, he would have been treated regally in Ardkeen. Attempting to surge clear, he was fouled and Stephen Brenner got the chance to lift the siege. His huge free went much further than seemed possible – was the wind conspiring with us now? – and the ball broke from Seamus Prendergast’s outstretched hand into the path of the onrushing Tony Browne. As Brendan Cummins advanced, Browne struck the ball first time along the ground between the goalie and the near post. It was a cheeky finish that Michael Owen would have been proud of, and suddenly there was clear water between Tipperary and ourselves. The reaction to this earthquake among the white and blue hordes was quite restrained. Apart from taking place miles away (sort of) from where we were standing, and it seemed like it took an age for the umpire to wave that green flag. Don’t start celebrating until you see that flag. But the players were transformed. Only the Tipperary players could confirm the truth of this supposition, but the Waterford team must have been a terrifying sight. Nostrils flared, eyes bulging, sweating adrenalin, they steamed after every ball as if their lives depended upon it. Any Tipp player foolish enough to get in the way was in danger of being trampled. As Ken McGrath continued smashing points over from the most improbable angles, Seamus Prendergast and Dave Bennett got in on the scoring act, allied to the sight of the oncoming subs high-fiving the men they were replacing, we began to realise that the impossible was about to happen: we were going to win the Munster Championship. I often wondered how I’d react to the sensation of victory. It would be great, obviously, and we’d cheer long and hard. But no amount of fantasising prepared me for . . . this. The brothers encapsulated the sheer weirdness of it all, one staring blindly into space as the enormity of it all slowly leaked into his system, while the other fervently wished that it could go on forever. That was why we could never have imagined what it would be like. It was because we never envisaged winning it pulling up. Victory, if it ever came, and there was plenty of doubt that it might, was always going to be snatched at the death, victory thrust upon us where only seconds before we had looked defeat in the face. This method of doing it gave us ten minutes to enjoy the moment, to sing “champione, champione” and wave derisively at the rapidly emptying Blackrock terrace. The only wobble in the last five minutes was not smacking Tipperary up a bit more as players started shooting on sight. The wides were racked up in those final minutes, but no one cared. God Himself could have come down on a cloud with the intention of gifting Tipp three goals, and the Waterford team would have run rings around him. The most astonishing thing about what was unfolding in front of us was that there was no room for arguments, no caveats to be attached to Waterford’s triumph. After beating Cork, we were told that the referee had been on our side, that the weather favoured us, that if the match had gone on for five more minutes we’d have lost, that Cork had been terrible and that they’d trash us if we met again the next day. But this time the team had slammed the door on such begrudgery before it could get out. Tipperary, the Munster and All-Ireland champions, the team to dominate hurling for a decade, had been demolished by a display of total hurling. No wonder we didn’t want it to end. It was a matter of savouring it all now. One lad behind us said as much, calmly (how could he be calm??) informing us all that we should take in every moment, store them away for future reference. A glance at the bench to see the players waiting to charge on like dervishes, looking around at the delirious faces of my fellow county men and women, dwelling momentarily on those players who had helped us get here but wouldn’t have the chance to sup at the top table; I took a few moments to savour it all, but for the most part I just cheered and screamed and chanted. And counted down the seconds until Aodhan Mac Suibhne – what a referee! – blew that last shrill blast on his whistle. Which he did. The famine was over. We had won. This entry was posted in Hurling, Match Reports, Munster, Waterford and tagged Munster, Thurles, Tipperary on 30/06/2002 by deiseach.